This roast lamb recipe serves 8-10 people with one-half of a suckling lamb or "lechazo," weighing 9-11 pounds. Lamb in the U.S. is generally very large since the most popular cut is leg of lamb. Lambs in the USA are slaughtered much older than it is customary to do in Europe. So, if you are unable to buy a suckling lamb through your local butcher, purchase a leg of lamb (bone-in). 1/2 suckling lamb approximately 9-11 lbs. 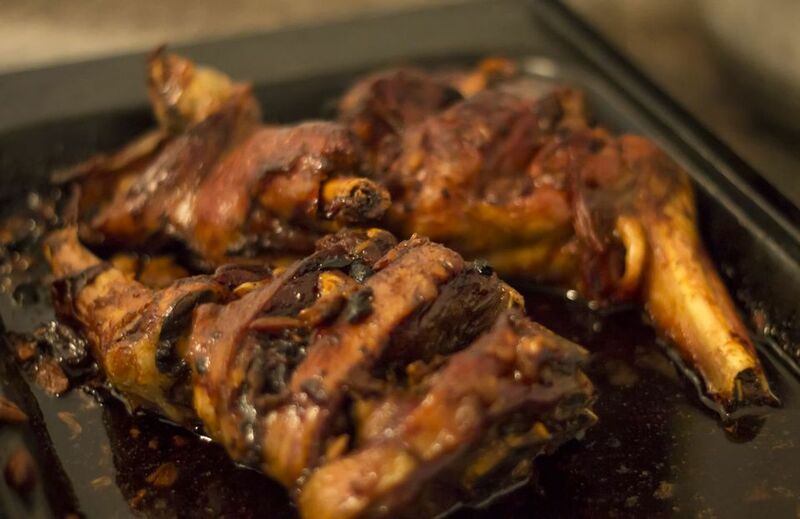 Note: Although the traditional method for roasting lamb includes rubbing the lamb with lard or vegetable shortening, extra virgin olive oil is now often used instead. In a small saucepan, heat the lard or vegetable shortening until it melts. If you prefer, use a small bowl and heat in a microwave oven. Heat oven to 400 F.
Rinse the lamb and pat dry. Trim off excess fat and discard. Place lamb in ​the roasting pan or another oven-proof dish. (Traditionally, the Spanish use large, open clay dishes.) Rub the lamb with salt and baste with the melted lard. Place in oven to roast. Occasionally baste with large and turn until lamb is golden brown on the outside and meat is tender. Roast potatoes are a great accompaniment to this dish. To roast potatoes, peel 8-10 small potatoes and cut in half. Place in the roasting pan around the lamb. Baste with large when you baste the lamb. The amount of time that the lamb spends in the oven will depend on how thick the piece(s) of meat are. A good rule of thumb for a bone-in leg of lamb at 400 F is to allow about 30 minutes roasting time per pound of lamb.